The MESH system has a high-resolution touch screen that lets visitors know exactly what they need and where they need to go. All text is oversized so it is easily visible for guests. Information is also presented in multiple languages with just a touch of a button. The system can be employed in indoor or outdoor settings with a screen that is visible in even direct sunlight. 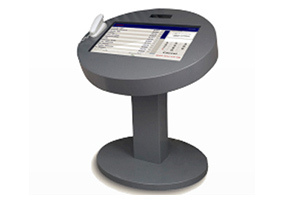 Available as a MESH panel, MESH pedestal, or MESH kiosk directory the Enterprise MESH is capable of fitting any building entrance. Apartments, condominiums and office buildings are just a few of the locations where security and communications are required to control resident and visitor traffic. Viscount‘s Enterphone Entry Control Systems take building security to a new level by providing a fully integrated telephone entry and access control solution. Viscount offers a variety of features and design options in its telephone entry portfolio. A 19” portrait-sized, gesture-activated touch screen brings a modern look and feel. Multi-lingual voice prompts provide verbal instructions and feedback to assist visitors with different language preferences. 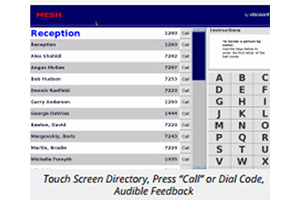 ADA-compliance features make using Enterphone extremely convenient for seniors who may be hearing or visually impaired. Enterphone panels can also function as an integral part of the property management marketing and resident services. The high-resolution, touch-screen display can be customized to communicate important information to visitors and prospective tenants. For example, “hot buttons” can connect directly to the sales and rental office for immediate response. 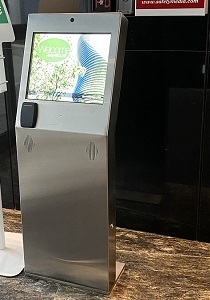 Enterphone is offered in a range of attractive designs and materials to serve as free-standing building information kiosks in a lobby setting. 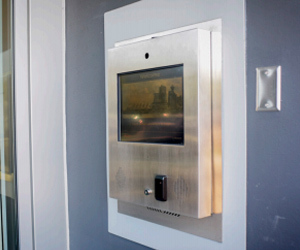 The first encounter visitors experience when entering a property will be a sleek, modern and intelligent entry system that delivers the highest quality services to its residents and visitors. All Enterphone panels are IP addressable and can be networked together or combined with Enterphone servers to provide a complete building security solution. Multiple language options available with verbal instructions and an active screen saver allowing visitors to select desired language. Verbal confirmation of access informs whether the visitor is allowed or denied. Video camera takes a JPEG of a visitor and relays that image to a DVR or cable TV (remote cable) for quick identification and enhanced security. Customized screen savers can be applied to better leverage branding and onsite messaging. “Hot buttons“ dial directly to security or management. Unlimited names with alphabetic “quick search”. Enterphone iQ (EiQ) is a cost-effective, powerful, feature-rich telephone entry and access control solution. Its easy-to-use interface and intuitive software allows property managers to monitor entry and exit access points, streamline operations, and increase the safety and security of their facilities. EiQ features a high-resolution LCD color display built for both indoor and outdoor environments. Its integral access control functionality and open software platform enables the system to be integrated with Viscount access control or third-party systems. The MESH system has a high-resolution touch screen that lets visitors know exactly what they need and where they want to go. All text is oversized so it is easily visible for guests. Information is also presented in multiple languages with just a touch of a button. The system can be employed in indoor or outdoor settings with a screen that is visible even in direct sunlight. 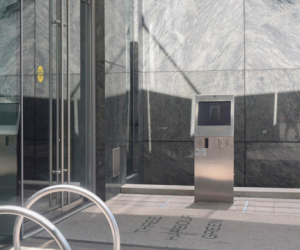 Available as a MESH panel, MESH pedestal or MESH kiosk directory, the Enterprise MESH is capable of fitting any building entrance. Enterphone MESH is an integrated visitor management and access control system for small, medium and large properties that require a higher level of security and facility control. 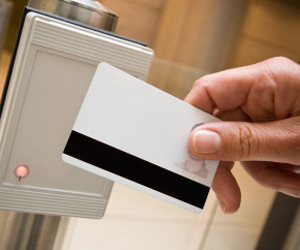 The system provides visitor access control to apartment buildings, gated communities, condominiums, office buildings and mixed-use areas. A tenant communicates directly with a visitor using Enterphone, and can grant or deny admittance directly from a telephone land line or cellular phone with the touch of a button. Enterphone MESH is easy to install and can be remotely managed using its Web-based software. The Enterphone MESH MicroServer is a bundled appliance that hosts Web-based access control software for facilities requiring up to 64 card readers, elevator control and telephone entry. Each MicroServer can act as a standalone visitor entry and access control system, or can be used as a distributed database appliance working with other Enterphone MESH MicroServers or Enterphone iQ telephone entry panels. 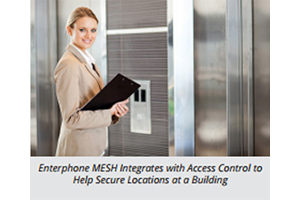 Enterphone MESH panels have the ability to interface with elevators to limit building visitor access. Elevators can be restricted to help secure sensitive or high-risk areas. The card reader can also limit suite and floor access. Software enabled notification features can dispatch an email upon a particular individual’s card presentation. The resident has control to allow lobby and elevator access, reject the visitor or request a guard or concierge. The system accommodates sites with guard services by dispatching security events to remote monitoring services or email. Door and elevator access may be controlled remotely as well. Several Enterphone MESH panels can be connected together in each building for automated access and updates. The Enterphone MESH MicroServer maintains a complete database of the current status of all audio channels in all buildings with an audit report for every call and access event on the system. One of the major benefits the Enterphone MESH Telephone Entry System offers tenants and visitors is a high-quality user experience. The Enterphone MESH lobby kiosk presents the user with a high-resolution, vandal-resistant Tough-Touch display screen that is very intuitive. The “Welcome” screen can be customized to display building information, concierge services or even a “paid” advertising functionality for local businesses and services. The panel display has a unique anti-glare coating that allows for day and night viewing, and can even be viewed in direct sunlight. Visitors can use the touch screen to find a name on the directory or use the “Search By Name” function then dial a code or press the “call” button. 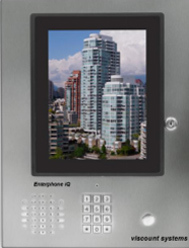 The Enterphone MESH keypad will verbally confirm each keypad number as it is entered to help avoid user errors. If the number is busy or goes unanswered, a secondary number can be programmed for each listing. Verbal Enterphone MESH prompts the user if the system is dialing, busy, if the door is unlocked, if the wrong number was dialed or if they are denied entry. The directory includes tenant listings, building information and “hot buttons”. 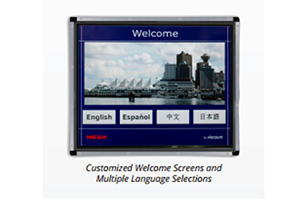 Multi-Language Display Enhances User Friendliness Enterphone MESH supports multiple language displays including English, French, Spanish, Chinese and Hindi. Enterphone MESH welcomes visitors and audibly assists the user by providing simple system instructions. Screen text also appears in the chosen language. After selecting the desired language on the screen, it will display the building directory. All text is oversized to visually assist the user. For commercial buildings, a special tiered directory is available. The main directory can display company-by-company lists and can also drill down to a specific company‘s directory of departments or employees. For entry gates serving multiple buildings, this feature can be used to separate the directory by building address, making it easy for visitors to find their destination. Flexible Codes Protect Privacy and Increase Security Enterphone MESH panels provide a number of secure code alternatives. Individual names and suite numbers can be listed or codes can be randomized to increase privacy. Tenants can even request that they not appear in the directory at all. Visitors would then need to know the correct code before arriving thus increasing the overall security of the facility. The actual occupant name can also be substituted with a proxy name to accommodate special needs such as home-based businesses. Viscount is the leading provider of next generation, IT-centric access control, telephone entry and visitor management applications. Viscount offers a full suite of visitor management systems to help streamline physical access control and telephone entry through one centralized system. Viscount’s Telephone Entry Systems product line includes options that set the standard in the industry in aesthetics, resilience and functionality. For more than 20 years, Viscount has been leading the industry under the brand name EnterphoneTM, a durable, user-friendly, integrated telephone entry and access control solution for facilities of any size. With Enterphone, building tenants and property managers can have confidence in the overall safety and security of their residence. Innovation and technology leadership is a core value at Viscount. The company continues to invest in product development and building a strong portfolio of intellectual property with 8 core patents and more than 60 claims filed since 2010. This continued innovation has earned Viscount a reputation for visionary product design and deployment that is unparalleled in the industry. Viscount Systems, Inc. has won numerous awards, most recently, Microsoft Corp‘s “Be What’s Next” award, and will continues to lead in security systems advancement.